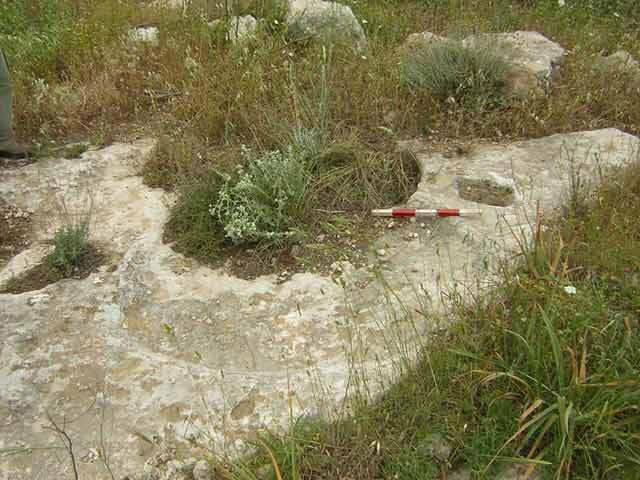 During April 2007, an archaeological survey was conducted in Moshav Amazya and to its south (Permit No. A-5095; map ref. 19100–224/60475–550), prior to expanding the village. The survey, on behalf of the Israel Antiquities Authority, was directed by E. Aladjem, with the assistance of S. Gal (GPS). 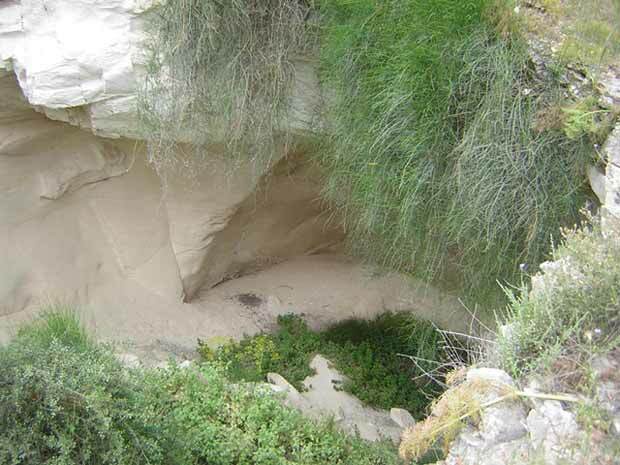 In the 1950’s, a survey was carried out, mapping and describing most of the caves around Moshav Amazya (Ben-Arieh Y. 1962. Caves and Ruins in the Beth-Govrin Area. IEJ 12:47–61). In the late 1980’s the region was surveyed again, the Arab village of Al-Dawayima was identified and it was discerned that the village remains are built on top of ancient architectural remains (Map of Amazya , Volume 1, The Northern Region: 29*–50*). Several rock-hewn installations, some of which are in caves, building remains and fragments of pottery vessels from the Chalcolithic, Early Bronze, Iron, Roman and Byzantine periods were described. The survey area extends across a hilly region with steep slopes that face south and southeast. Remains of the Arab village of Al-Dawayima are visible along the surface of the hill, particularly farming terraces and enclosure walls, cisterns, cave dwellings and isolated architectural remains (Fig. 1). Forty sites (1–40) were documented. 1. Map ref. 191954/604220. A cistern with a round opening (diam. 0.5 m). 2. Map ref. 191693/604464. A shallow cistern with a round opening (diam. 1.5 m). 3. Map ref. 192162/604773. A cistern with a round opening (diam. 0.6 m). 4. Map ref. 192168/604765. A cave (2×5 m; Fig. 2) with signs of rock-cuttings. The roof of the cave collapsed inside. 5. Map ref. 192062/604765. A collapsed cave. 6. Map ref. 192050/604751. 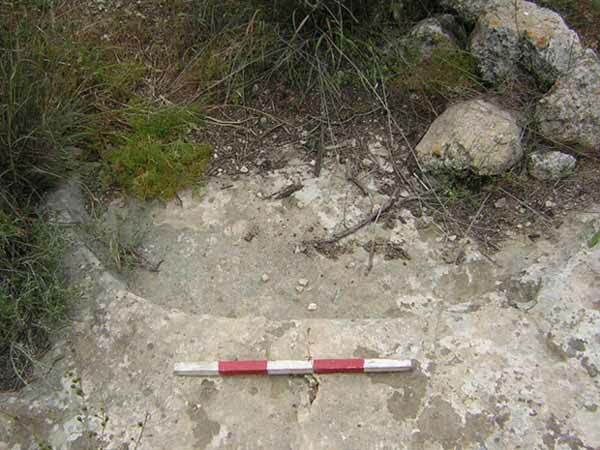 A semicircular structure, probably from the period of the Arab settlement. 7. Map ref. 191981/604745. A large structure built of dressed stones and vaults. 8. Map ref. 192077/604739. A storage pit inside the remains of a building (diam. 1 m, depth 1.2 m). 9. Map ref. 192149/604761. A cave dwelling consisting of two rooms with rock-cut installations in the walls and a courtyard surrounded by a fieldstone wall. 10. Map ref. 192217/604739. A rock-hewn cistern with a round opening (diam. 0.5 m). 11. Map ref. 192292/604725. A cupmark hewn in a bedrock terrace (diam. 0.5 m, depth 0.3 m; Fig. 3). 12. Map ref. 192306/604718. A rock-hewn winepress on a bedrock terrace (Fig. 4). 13. Map ref. 192211/604633. A cistern with a square renovated opening. 14. Map ref. 192195/604639. A built and renovated cistern equipped with a filling channel. 15. Map ref. 192182/604637. A cistern with a round opening (diam. 0.5 m). 16. Map ref. 192082/604621. A cistern with a round opening (diam. 0.5 m). 17. Map ref. 192071/604625. A collapsed cave dwelling with signs of rock-cuttings inside it. 18. Map ref. 192015/604670. A collapsed cave dwelling with signs of rock-cuttings inside it. 19. Map ref. 192169/604660. A cistern with a round opening (diam. 0.5 m). 20. Map ref. 190920/605024. A cave dwelling (1.5×2.0 m) with signs of rock-cuttings inside it. A fieldstone wall is built in its opening. 21. Map ref. 190965/605008. A cave dwelling (length 2 m, width 1.5 m, depth 1.5 m) with signs of rock-cuttings inside it. 22. Map ref. 191141/604836. A cave dwelling (2×5 m) with signs of rock-cuttings inside it. Its opening is blocked by a fieldstone wall. 23. Map ref. 191161/604856. A cistern located at the intersection of two farming terraces. Its opening is circular and hewn in a monolith. 24. Map ref. 192419/604423. A cave dwelling with two openings. 25. Map ref. 192428/604411. A cistern with a hexagonal opening. 26. Map ref. 192436/604377. Cupmark (diam. 0.6 m). 27. Map ref. 192297/604618. A cistern with a round opening (diam. 0.5 m). 28. Map ref. 192299/604622. A cistern with a round opening (diam. 0.6 m). 29. Map ref. 192303/604621. A cistern with a round opening (diam. 0.4 m). 30. Map ref. 192293/604623. A cistern with a round opening (diam. 0.5 m). 31. Map ref. 192083/604621. A cistern with a round opening (diam. 0.5 m, depth 0.8 m). 32. Map ref. 192070/604624. A cave dwelling with signs of rock-cutting inside it. 33. Map ref. 192097/604598. . A cistern with a round opening (diam. 0.6 m). 34. Map ref. 192304/604514. A built cistern with a channel for storing water. Its opening is built of dressed stones. 35. Map ref. 192176/604477. A cistern with a square built opening. 36. Map ref. 192298/604424. A cave dwelling next to the ruins of the Arab village. 37. Map ref. 192316/604442. A cave dwelling with a fieldstone-built opening. 38. Map ref. 192316/604405. A cistern located in a natural cave. Rock-hewn steps lead to its bottom (diam. 1 m, depth 1.5 m). Next to the opening is a fieldstone-built wall. 39. Map ref. 192263/604336. A cistern with a round opening (diam. 0.5 m). 40. Map ref. 192347/604353. A cistern with a round opening (diam. 0.5 m). 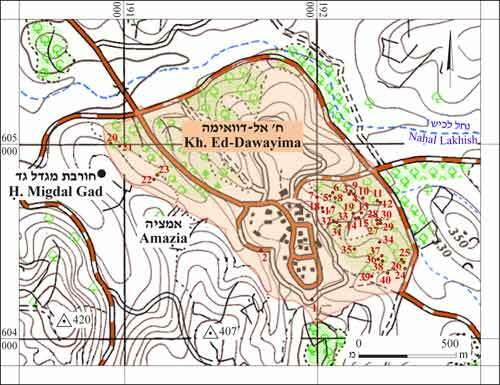 The survey area extends south and southeast of Moshav Amazya, along the fringes of the Al-Dawayima village. Among the finds documented in the survey are cisterns, farming terraces and enclosure walls, several cave dwellings and building remains. Most of the cisterns and caves were hewn in antiquity and were also used during the period of Arab village. 2. Site 4, a collapsed cave dwelling, looking north. 3. Site 11, cupmark, looking north. 4. Site 12, winepress, looking north.